Do you enjoy a nice cup of tea? Are you into green teas or specialty coffees? Then the Cuisinart CPK-17 is the electric kettle for you. We all remember Grandma’s teapot that whistled when the water inside reached a boil and steam came out of the spout. Those days are over. This electric kettle from Cuisinart brings tea or specialty coffee making into the 21st century with all the features that have long been available for coffee makers, and then some. One very common misconception about green tea is that it tastes bitter. Many of us have steeped our green tea with boiling water, and the results were less than pleasant. What most of us don’t know is that water temperature is very important when making delicate teas, like green tea, or specialty coffees. The Cuisinart CPK-17 has six different temperature settings which allow the user to select the appropriate heat for the tea or coffee that they are serving. Temperatures range from 160 degrees for delicate and green teas, to boiling for standard teas and coffees. Another great feature on this electric kettle is the hold warm function. In the past, we had to reheat our tea kettle each time we wanted a cup of tea. The Cuisinart CPK-17 keeps the water inside of it at the precise temperature you need for up to thirty minutes. This makes having more than one cup of tea at a time much easier. It’s also great when you are entertaining a group of friends. The kettle can also be removed from the base for up to two minutes, and it will remember which temperature setting you had it on. This electric kettle sounds pretty good so far, but how easy is it to clean? Three built-in features make cleaning the CPK-17 a cinch. This electric kettle features a built-in, removable, and cleanable filter screen that filters out medium to large sediments that may be present in your tap water. Also, the heating element is in the base of the unit, not the kettle, which cuts way down on mineral build-up. This kettle also features a sensor that shuts the heating element off when the kettle is empty. This prevents burning and discoloration of the great-looking stainless steel. With all of the features available on the CPK-17, you might think that it is very complicated to use. That is not true. The kettle separates from the 360-degree swivel base by simply lifting upwards. The non-slip, stay cool handle on the kettle eliminates the need for an oven mitt or hot pad to serve. The buttons are well labeled and backlit by LED light, and also feature one-touch technology. A water level window on the side lets you monitor how full your electric kettle is at all times. A single button pops open the top of the kettle in order to fill it up. Overall, this electric kettle is very simple to use. Q: How long does it take to boil water? A: Users report that it takes about 7 minutes to bring water to a boil. Q: Does steam come out of the kettle when it is heating? A: Yes. Steam comes out of the spout much like a traditional teapot. Q: Is the Cuisinart electric kettle dishwasher safe? A: No. Cuisinart recommends cleaning with a soft damp cloth. Dishwashers will damage electronic components. 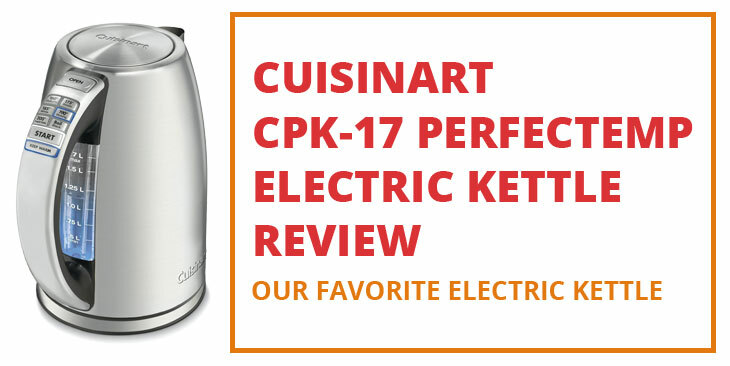 While the expensive price tag may scare away some casual tea drinkers, the Cuisinart CPK-17 Cordless Electric Kettle is a fantastic kitchen tool for most people. Fans of green tea finally have a kettle that allows them to prepare it properly. Six different temperature settings allow you to heat water from 160 degrees to boiling. The hold warm feature is great for multiple cups or entertaining guests. This electric kettle is both very easy to use and easy to clean. Many users report five years of use with no problems and high satisfaction. Overall, We are very impressed with the materials and features that this kettle has for a very reasonable price. If you are still looking for an alternative to this electric kettle than don't forget to check our best electric kettle list.